Loving” is one of the two core principle values that drives Rec Therapy Today. The other core value is “learning. Gary Chapman is the author of several books that teach five love languages. Chapman argues that some people only feel loved if it is expressed in their core love language. A person who wants real quality time, but only gets gifts won’t feel loved. A person who wants a gift every so often, but only gets an abundance of quality time may not feel loved. One approach is to provide all five types of love and you’re bound to get it right. Recreational therapists like many professionals provide compassionate care for people. Ethically, our care is one direction. We care for people (our patients, customers, clients) who receive our services unconditionally. It is a giving relationship. Our patients/ clients are not our friends. We’re getting paid to provide them with services. We’re not getting paid so that they can provide us with serveries like friendship. It would be an ethical violation to have a dual relationship with a patient. Recreational therapists can definitely facilitate the five love languages in their overall treatment approach. Words of affirmation: We can verbally affirm and validate the worth of a person. We can purposely use positive words when we communicate. We can uses our words to encourage, inspire, and advocate. Touch: This is an important love language. Professionals must use this one cautiously. A child may very well need a pat on the back, a high five, or a side hug. A person who is elderly may very well need a kind hug too. It is good to be cautious to avoid causing harm. A patient may not feel comfortable with a hug or a touch. I provide education to patients (children) that if they need a side hug or high five to ask first. Most of the time, I’ll say yes. Gifts: Ethically, we’re not permitted to give gifts to patients. We can’t single out one patient, Jane, and provide her with nice jewelry or even clothes. Kids in our residential treatment program receive gift for their birthday and several gifts from Christmas. But the gift isn’t from a single person. Birthday gifts are from the facility. We, recreational therapists do offer a different type of gift, which is our services. We create positive memories and experiences. A patient may complete a craft as part of a therapy activity, which they can take with them as a souvenir. Chores: We can do little helpful activities beyond our job duties. Some of our kids (in our residential treatment program) struggle with little things like opening a milk box or opening a ketchup. We can help with those things. We help our kids with doing laundry and folding laundry. We help them clean their rooms. Of course, we’re not going to do chores that will enable a person to avoid responsibilities. Quality time: Recreational therapists spend quality time with their patients when they’re providing services. This time could be during a community re-entry outing or sitting with a patient during lunch. We’re being there for them. Ethically, it is a slippery slope to spend additional one-on-one time with any patient outside of scheduled group or individual sessions. Overall, we recreational therapists can express love and compassion for people who we provide services for. 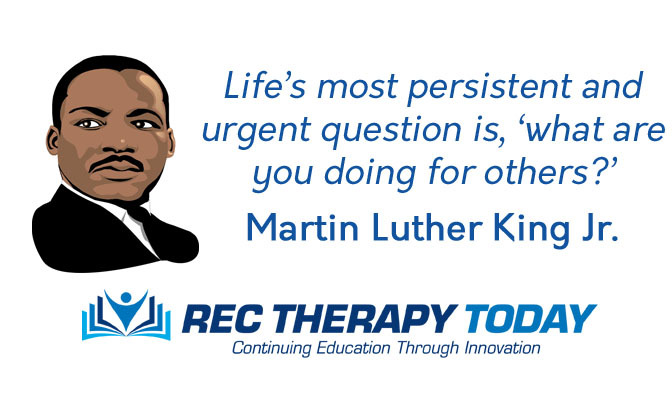 When Martin Luther King Jr. asked, what are you doing for others? We, recreational therapists can feel validated that we’re in a human services profession. We’re in the helping field. We make our living out of helping and caring. At the end of the day, we, recreational therapists can rest well knowing that we went out there and attempted to do our best at caring for those in our services, unconditionally. Post below ways you help others in any area of your life. Other people would enjoy reading your comments!